Burnt out and facing a quarter-life crisis, Alex Sheshunoff quit his Internet job in New York City and bought a one-way ticket to Yap, bringing with him a few t-shirts and the hundred books he was most embarrassed not to have read. 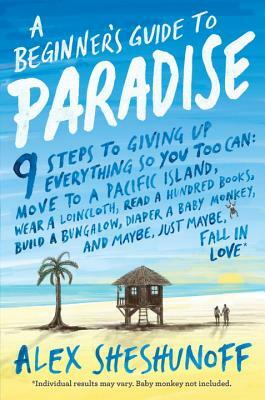 While out there, he'd read those books, meet a woman, build a bungalow, adopt a baby monkey, and write his own book- a hopefully-humorous memoir called A Beginner's Guide to Paradise. Because of his unique last name, Alex is often asked if he's somehow related to Ian Shenanigan Sheshunoff, the first-place winner of the Diaper Derby Crawling Contest at the 2008 Alaska State Fair. They are indeed related. Ian is his son. Today, Alex and his wife, Sarah, live in Ojai, California with Ian and his equally talented younger brother, Andrew Commissioner Sheshunoff.